Although husbandry parameters vary from one species to the next, lepidopterans – including moths, skippers and butterflies -- all exhibit similar lifecycles and reproductive habits. After passing through developmental stages and becoming mature adults, male and female butterflies mate by pressing their abdomens together. A short time later, females deposit numerous tiny eggs on host plants, on which the hatchling caterpillars feed, grow and perpetuate the lifecycle of the species. Although entomologists are still working out the specific cues that trigger reproductive behaviors, environmental cues, such as day length and temperature, probably play a role. Once the urge strikes, males of many species begin seeking and courting females by performing visual displays and emitting pheromones. The males of some species take up position on a conspicuous perch while waiting for females to fly by; others follow female pheromone trails for up to a mile to locate potential breeding partners. While the females of some species select the males with which they will mate, the males of some species actually locate female caterpillars, wait for them to pupate and then guard their pupae until they emerge, at which time the males mate with the females, who are unable to fly away. 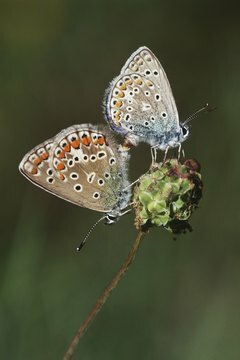 Butterflies land on the ground or a suitable perch to mate. After turning to face away from each other, they join the tips of their abdomens. The male then transfers a packet of sperm -- called a spermatophore -- to the female’s body, where it will fertilize the waiting ova. Some species are capable of flight while mating, which can help them escape predators during what would be a vulnerable situation. The females of most species deposit their eggs on a specific plant species -- termed a host plant. After hatching, the young caterpillars, which represent the larval stage of the butterfly lifecycle, begin feeding on the host plant. In some cases, the host plant has toxic properties that are harmless for the insects, but afford the caterpillars an additional layer of protection from hungry predators, as they can sequester the poisonous chemicals within their bodies. Once the caterpillars gave grown substantially, they form a chrysalis or cocoon in which they undergo a developmental process called metamorphosis. Later, often after overwintering, the adult insect emerges from the pupa and begins seeking out a mate. While the vast majority of butterfly and moth species engage in sexual reproduction, at least one species – the mulberry silkworm (Bombyx mori) -- is capable of asexual reproduction. A percentage of these moths reproduce via parthenogenesis, yielding offspring with essentially identical DNA as the parent. This can be a benefit to the species if the original parent was exceptionally fit, but it can also doom an entire clutch of young, if the parent was an inferior specimen.